← [NSFW] Gary MF Oak is here! Sona – The Maven of the Strings is a fairly old Champion in League of Legends (at least in internet time), she dropped on September 20, 2010 and she carries with her a dark legacy of hatred. Well known as one of the most overpowered champions in the game even after countless nerfs; Sona is forever remembered for her unstoppable laning phase which many a gamer has felt the wrath of. Contrary to popular belief her power was not derived from her light healing but rather from her outstandingly high base damage with Hymn of Valor and the combos available with her passive. The ever-lovely Sona has been nerfed countless times but never really felt any of them, she is a notoriously easy champion to play; and most likely even now has the lowest skill cap in the game. Her biggest nerf comes with the removal of the Innervating Locket in v1.0.0.107; Innervating Locket was a fairly controversial item, being nerfed harshly about 4 times since it’s release. The locket was originally intended for Support characters and is/was completely balanced when used on them – however through someone’s clever innovation tanks began carrying it and it just so happened to give them psuedo-invincibility during the laning phase. Now without Locket people are saying Sona is dead, saying she’s now Soraka-tier. Generally I only play champions I have fun with; and I previously I found Sona incredibly boring; however with her recent changes she appears to take a lot more skill then she initially did; unfortunately the skill cap on her is still probably the lowest. HOWEVER: Riot implemented a buff to her this patch as well and that happens to be the reason I’m playing her. 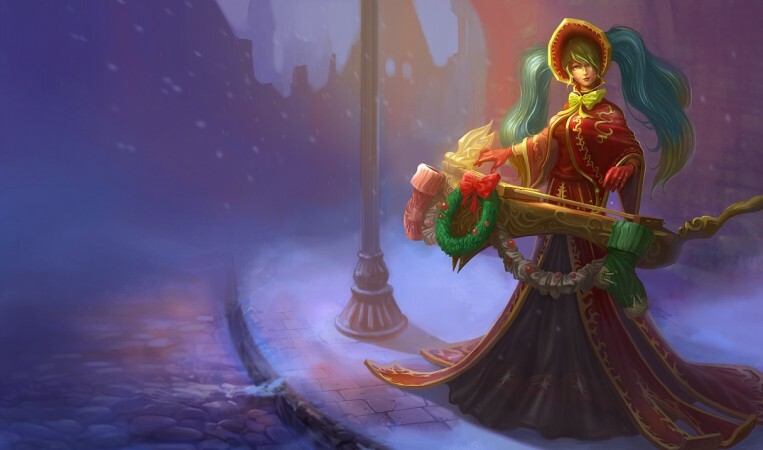 This buff comes in the form of SILENT NIGHT SONA. Sona’s new skin which can be seen at the top of this guide is AMAZING. She looks like Hatsune Miku and that was all the motivation I needed to buy it and play her. So without further adieu, here’s my Post-Locket Sona build. Flash – Good ‘ol Flash, personally I support the Flash nerf; mainly because of the power it brought to careless players. Good players used it in a multitude of ways which made sense; however careless players were able to use it to escape ganks with ease. Personally I just think that bad play should be punished rather then rewarded. I have similar issues with Tyrandamere’s ult; but I digress. Sona doesn’t really have an escape ability; I grab Flash on her since I’m generally hanging back it allows me to quite frequently hop over a wall to escape. Clarity – Don’t stop reading yet! I have reasons for choosing Clarity; personally I’ve never really had trouble with ganks so I take it over Clairvoyance and I don’t think I need any more mobility so I skip Ghost. Clarity makes up for the loss of Locket and allows you to greatly support your team when you have your summoners in Utility; which this guide recommends. Standard 9/0/21 build grabbing masteries in both Clarity and Flash. I take Magic Pen reds because there’s not really any viable alternative. Her AP ratios are terrible and I don’t want to put secondary runes in those slots. Magic Pen gives you added damage and just happens to be better than the other picks. Clarity for mana regen and focus to abuse CDR awesomeness. Fort because you can’t go wrong with more HP. Power Chord – (Passive) After casting 3 spells, Sona’s next attack deals extra 24 (+12 per level or +240 at champion level 18) magic damage. Additionally, Sona’s Auras persist for over 2 seconds after deactivating and set off a 2 second global cooldown. Hymn of Valor – (Q) Passive Aura: Sona plays the Hymn of Valor, granting nearby allied champions bonus attack damage and ability power. Activation: Sona sends out bolts of sound, dealing magic damage to the nearest two enemy champions or monsters. Aria of Perseverance – Passive Aura: Sona plays the Aria of Perseverance, granting nearby allied champions bonus armor and magic resistance. Activation: Sona sends out healing melodies, healing herself and a nearby wounded ally. Song of Celerity – (E) Passive Aura: Sona plays the Song of Celerity, granting nearby allied champions bonus movement speed. Activation: Sona energizes nearby allies with an additional burst of speed for 1.5 seconds. Crescendo – (R) Sona plays her ultimate chord, forcing enemy champions to dance (stun) and take magic damage over 1.5 seconds. Here’s the core build, simple enough right? Rather then shooting directly up to an Archangels I feel it is probably a better idea to work on your Deathfire Grasp. Why? Because if the game has dragged on this long then you are really going to need the CDR and tank killing power of DFG as soon as possible. Your mana shouldn’t be a problem at the point anyway. After obtaining DFG pick up your Archangel, the AP isn’t that great but you might as well. Finish off the build with Aegis and finally a Zhonya to ensure that you and your carry are able to stay up through anything. This entry was posted in League of Legends. Bookmark the permalink.